Logitech's latest speaker is an Apple AirPlay-compatible wireless speaker in the shape of the Logitech UE Air Speaker, that comes with good looks and a relatively wallet-friendly price tag. The speaker, which uses Wi-Fi to pump your uncompressed tunes wirelessly from an Apple iPad, iPod Touch or iPhone, offers dual tweeters and woofers, as well as custom-tuned acoustics. Logitech promises that these will deliver "a big soundstage" with "impressively detailed stereo sound", but we'll have to reserve judgement on that until we get our ears on it. The UE Air Speaker is a curvy affair, with sleek looks that Logitech reckons includes "subtle curves" (they're not that subtle) and comes in a piano-black finish which is marketing speak for shiny black. UE, incidentally, stands for Ultimate Ears. Thank goodness you don't have to go in the shop and ask for that, eh? Users will have to download the Logitech UE Air app to stream music, and it comes with a dock connector so you can charge your iDevices and play music from older Airplay-less models too. 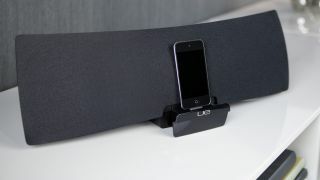 The Logitech UE Air Speaker is heading Europe-wards in April 2012 with a price tag of around £299 (should hit the US for around $399.99) – not a bad price for a good-looking Airplay speaker.